Accessibility doesn’t happen by magic – it takes a thoughtful redesign to make most existing homes work for a family member who uses a wheelchair. 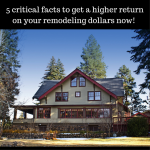 Here are 3 specific design recommendations Karen adopted from her project designer (Jeff Merrell of Cleveland Design and Remodeling). 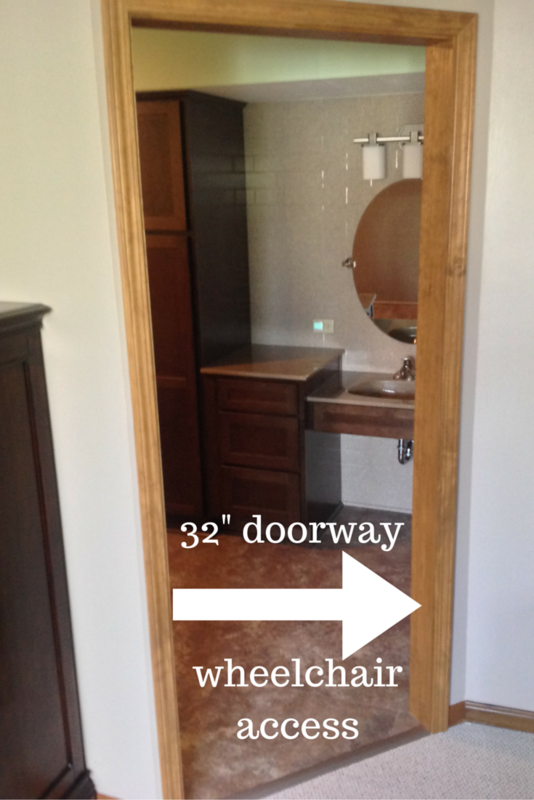 (1) Increase the doorway to 32” wide – Yes – this change was a no-brainer. You can’t independently enjoy your bathroom if you can’t smoothly get through the door! (2) Tradeoff storage space for open floor space – Life is about tradeoffs – especially when you’re looking at a bathroom which is usually not the biggest room. 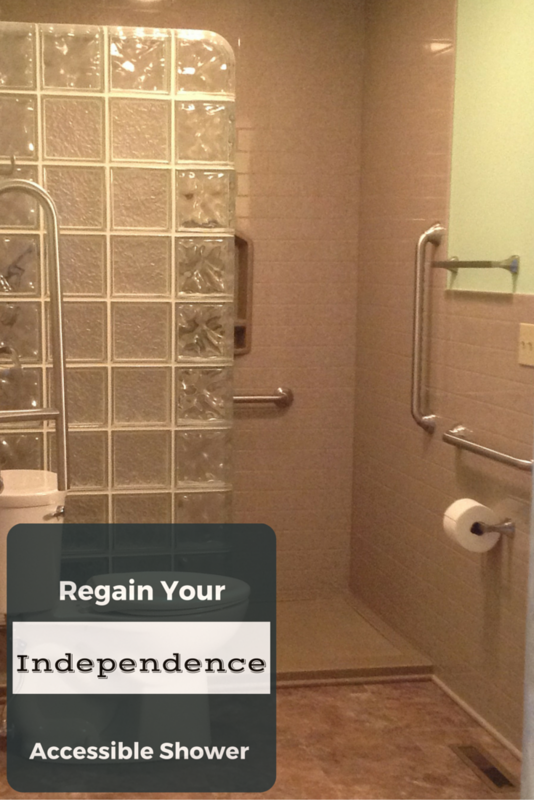 The best accessible bathroom design provides a 5’ turning radius for a wheelchair. Karen chose to eliminate an upright storage cabinet so she had the space to turn her chair around. 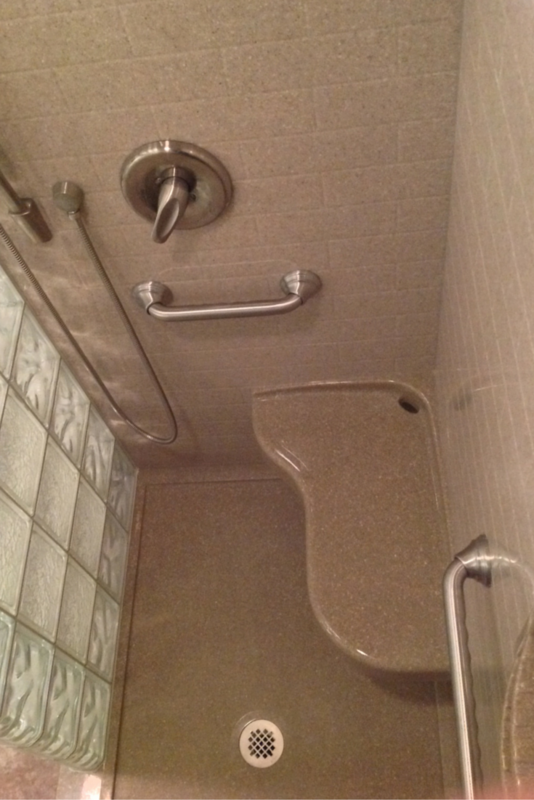 (3) Ditch the shower door – The new walk in shower (along with strategically placed grab bars) makes it possible for Karen to transfer out of her chair and onto the extended solid surface bench seat in the shower without having to hassle with a shower door. Roll under sink – With a wide and deep opening underneath the vanity top it is a breeze to get washed up while seated in the wheelchair now. Extended 26” x 16” stone solid surface bench seat – The longer bench seat is easy to transfer into, and since it’s built with a stone surface it is as solid and sturdy. Hand held shower – This feature is essential to showering from a seated position and it also makes it easy to clean the shower floor vs. a wall mounted shower head. Flimsy glass shower doors and nasty grout are two of the biggest pet peeves people mention about their current bathrooms. 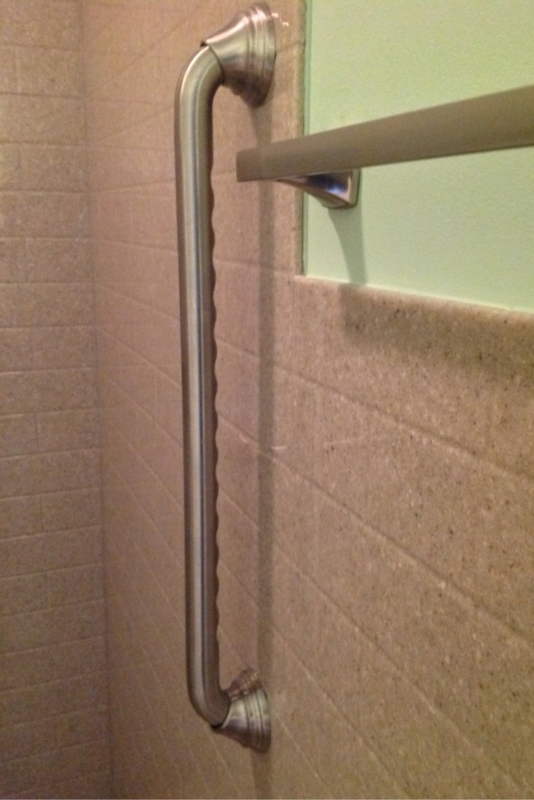 In Karen’s case eliminating grout and the shower door were two goals she had …but she didn’t want do this without having stylish products which were built to last. Her daughter Julie was also going to make sure though these stylish products were also going to be safe for Mom. Let’s look at two pivotal finishing material selections Karen chose to get durability and style. 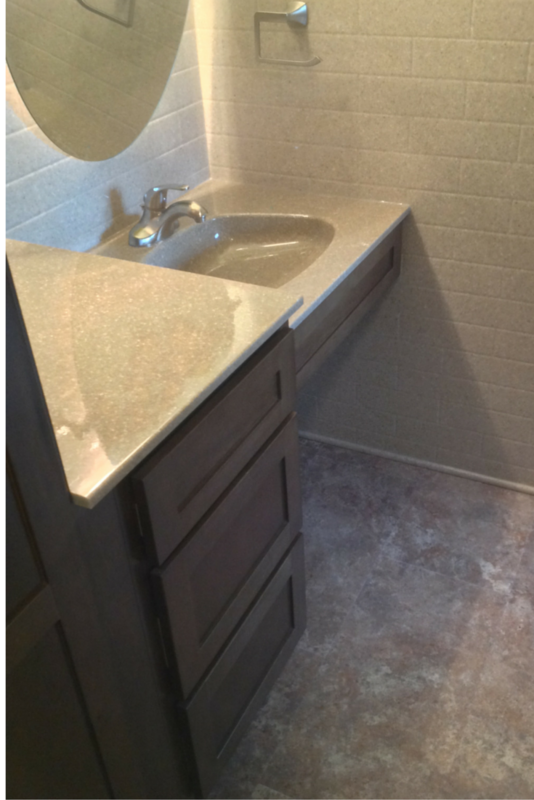 Subway tile solid surface walls and smooth vanity tops – Karen loves the subway tile look of the solid surface (single piece wall panels) 3/8” thick non-porous pattern walls. It’s nice to know she’ll never have to clean nasty grout joints again! 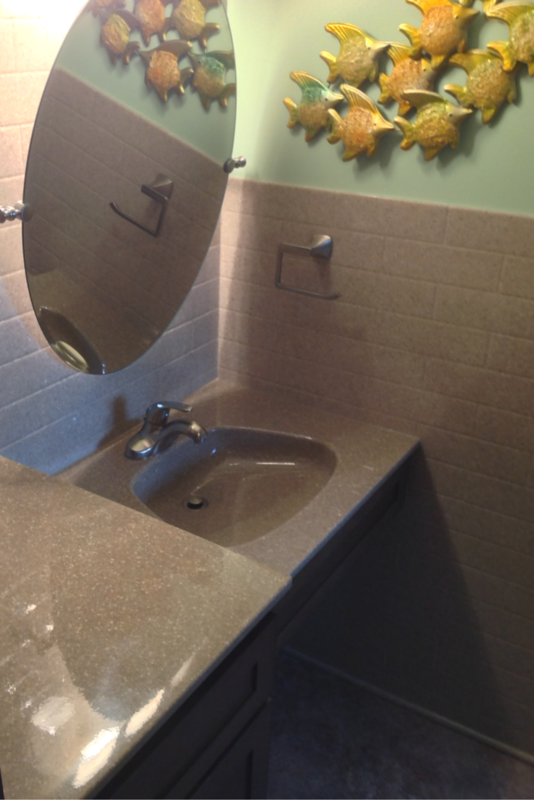 The smooth solid surface vanity tops are also simple to clean. 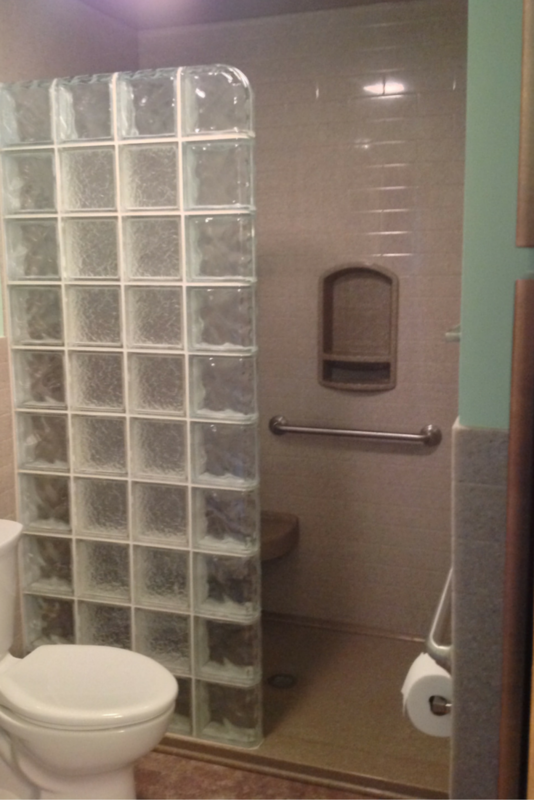 Glass block wall – Unlike thin 1/8” to 3/8” thick glass enclosures Julie knows Mom will be safe with the 4” thick glass block wall system. For added strength the team at Cleveland Design and Remodeling used the “Protect All” assembly and anchoring system which is far more rigid than a standard mortared glass block wall. 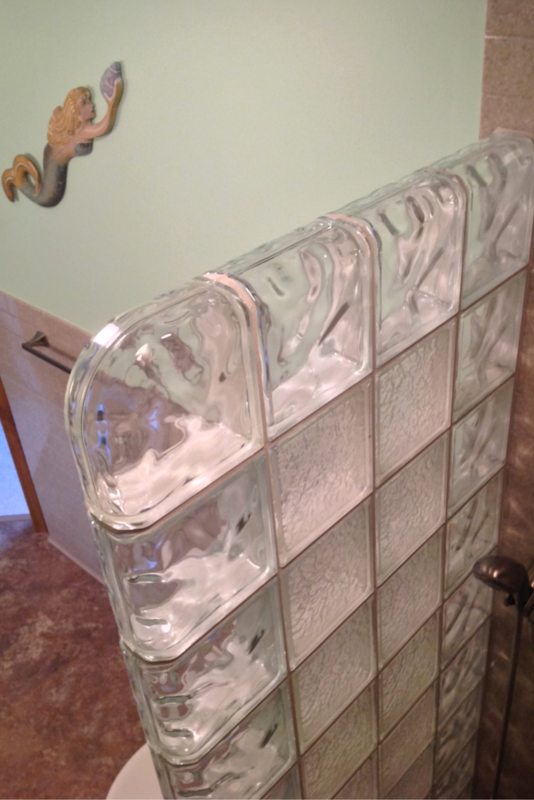 The small grout joints (1/8”) in the glass block shower are a nice benefit as well as the two patterns (Decora and Icescapes) which were used for additional style. 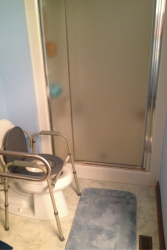 What do you think about Karen’s accessible Akron bathroom? Please comment or call one of the numbers below for additional input or a free design consultation. If you’re looking for more information or an estimate on remodeling a shower or nationwide material supply for the various wall panels and accessible shower bases mentioned above call Cleveland Design and Remodeling (216-658-1270), The Bath Doctor in Columbus (614-252-7294) or for nationwide supply Innovate Building Solutions (877-668-5888).